Composer, conductor, and teacher of music; born at Stuttgart Nov. 27, 1804; died in London June 5, 1885. Showing considerable musical talent as a boy, he became, at the age of fifteen, the pupil of Hummel at Weimar, and was introduced by him to Beethoven. In 1821 he went to Dresden to study musical composition under Weber, who treated him like a son. Having filled conductors' posts at Vienna from 1823 to 1825, he went with Barbaja to Italy in the latter year, and obtained an appointment as conductor at Naples, where he produced two of his own operas, "Gracinta ed Ernesto" and "I Porthocesi in Goa." In 1835 he went from Paris to London, where he resided till his death. He was conductor at the Lyceum in 1836 and at Drury Lane in 1838, where some of his own chief works for the operatic stage were produced. After visiting America with Jenny Lind in 1850, he became successively conductor at Her Majesty's Theater and at Drury Lane. Sir Julius held a prominent position in the musical world for upward of forty years, as conductor and as teacher. He contributed much to the initial success of the Monday Popular Concerts at St. James' Hall. He was knighted in 1871; and, among other distinctions, was decorated by the emperor of Austria in 1874, and made knight commander of the Order of Frederick by the king of Württemberg. He was twice married. 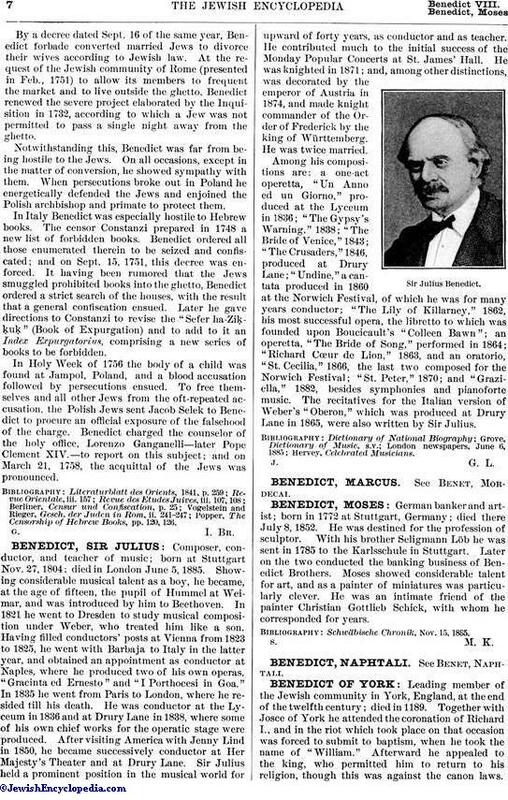 Among his compositions are: a one-act operetta, "Un Anno ed un Giorno," produced at the Lyceum in 1836; "The Gypsy's Warning," 1838; "The Bride of Venice," 1843; "The Crusaders," 1846, produced at Drury Lane; "Undine," a cantata produced in 1860 at the Norwich Festival, of which he was for many years conductor; "The Lily of Killarney," 1862, his most successful opera, the libretto to which was founded upon Boucicault's "Colleen Bawn"; an operetta, "The Bride of Song," performed in 1864; "Richard Cœur de Lion," 1863, and an oratorio, "St. Cecilia," 1866, the last two composed for the Norwich Festival; "St. Peter," 1870; and "Graziella," 1882, besides symphonies and pianoforte music. The recitatives for the Italian version of Weber's "Oberon," which was produced at Drury Lane in 1865, were also written by Sir Julius.